When traveling in a country as old as Greece, ancient ruins can quickly go from magnificent to mind-numbing. Great — yet another nameless hill with more stony remnants of people from centuries past. Just because something dates from BC doesn't mean it has to be seen. Be selective about your ancient sightseeing. Three of my favorite ruins are Delphi, Epidavros, and Mycenae. All are within three hours of Athens — and all are well worth the trek. Perched high on the slopes of Mt. Parnassos, Delphi was one of the most important sights in the ancient world. People would journey here from all over to seek wisdom from the oracle, who served as Apollo's earthly mouthpiece. By the sixth century BC, Delphi became so influential that no great leader would make a major decision without first sending emissaries to consult the oracle. Because so many people would come and spill their truth about the state of their homelands, Delphi became the database of the ancient world. And the priests (there to interpret the oracle's riddles and rants) learned more than enough to dispense divine-quality advice. The actual site and its archaeological museum are a half-mile east of the modern town of Delphi. I suggest visiting the site first (while you still have energy for the steep climb up), so you can more easily imagine the original context of the items you'll see in the museum. The archaeological site contains the ruins of the Sanctuary of Apollo, a place of worship centered around the temple where the oracle prophesied. Surrounding the temple are the remains of grand monuments built by grateful pilgrims. But there was more to Delphi than just the oracle. You'll also see the theater and stadium where the Pythian Games were held. Occurring every four years in honor of Apollo, the games were second only to the Olympics in importance. Not only did they feature athletic contests, but also dance, drama, and music — including some sort of "Pan-Hellenic Idol" singing competition. I like exploring these venues at the end of the day with all of the tourists gone, cheers of the ancient crowds still ringing in the cool mountain air, and the starting block all mine. For a truly stunning theater experience, a trip to Epidavros is a must. Located in the northeast part of the Peloponnesian Peninsula, Epidavros is near Nafplio — my vote for the most charming town in Greece and a good home base for exploring these ruins. In 400 BC Epidavros' sprawling complex of hospitals and sick wards was the most famous healing center in the Greek world. It was a place of miraculous cures, where the sick came to be treated by doctor-priests doing the work of Asklepios, the Greek god of medicine. 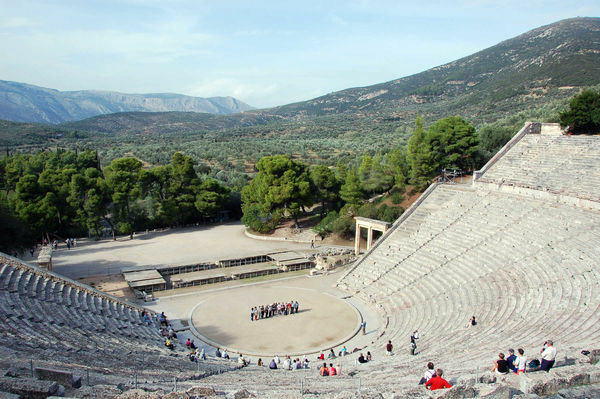 The highlight of Epidavros is its fine theater, which provided entertainment for those who made the pilgrimage here. Given its size (it seated up to 15,000) and obvious lack of modern amplification, the acoustics needed to be perfect. They were...and still are. Sitting in the most distant seat as your travel partner stands on stage, you can practically hear the retsina rumbling in her stomach. About 45 minutes north of Nafplio, ancient Mycenae is the oldest sight you'll see in this land dotted by so many ruins. The Mycenaeans dominated the Greek world between 1600 and 1200 BC, about a thousand years before the rise of Athens. These were the early Greeks Homer wrote of in the Iliad and the Odyssey. Following in the same ancient sandal-steps as the Greeks, you'll enjoy Mycenae's majestic setting of mountains, valleys, and the distant sea. But the location was more than scenic; it was strategic. Surrounded by enemies, the Mycenaeans needed a heavily fortified capital on an easy-to-defend hill. Though now just scant ruins remain today, the city's mighty Lion Gate entrance is still awe-inspiring. Royalty were buried in massive beehive-shaped underground chambers, such as the Treasury of Atrius tholos tomb. The tomb's massive igloo-style dome was made of 33 rings of corbelled (gradually projecting) stones, each weighing about five tons. Kings were elaborately buried in the center of the room along with their swords, jewels, and personal possessions. After the funeral was over, the whole structure was covered with a mountain of dirt. But grave robbers weren't fooled and got in anyway, so modern archaeologists have not found any bodies. When it comes to Greek ruins, Athens' Acropolis and Agora are a given. 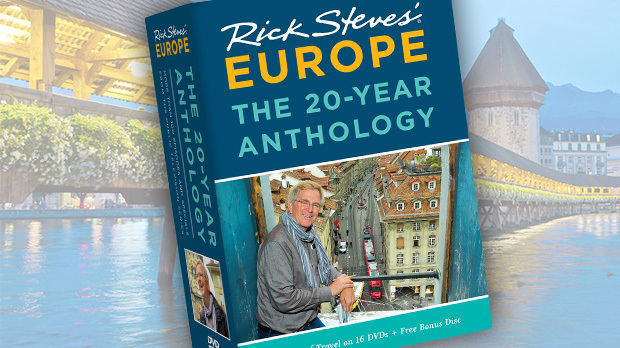 But to me, the joy of Greece is outside of Athens. 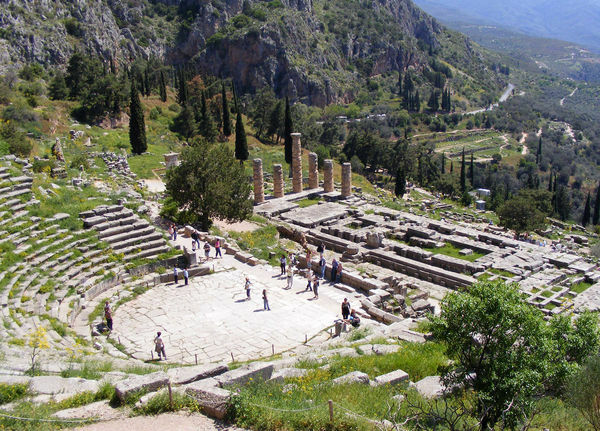 Once you're done with the big city and its requisite sights, hit the road and head for Delphi, Epidavros, and Mycenae. 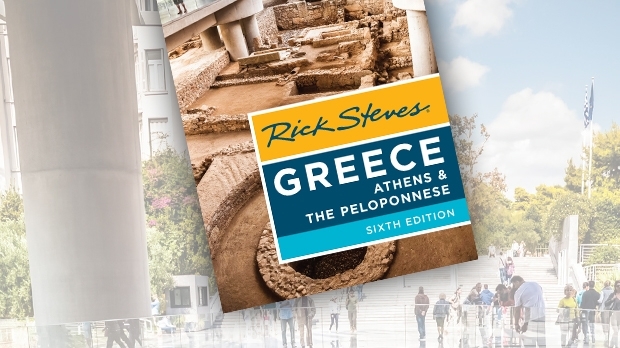 Each offers a unique opportunity to delve into ancient life and explore Greece's rich history.